Walk a Mile out to sea!! Posted on May 17, 2013 by helensamia under Other things! One of the joys of our trip to Western Australia was to be able to walk along the Bussleton Jetty which stretches a mile out to sea. A great way to start the day and blow the cobwebs away!! “Busselton Jetty is the longest wooden jetty (pier) in the southern hemisphere,stretching almost 2 km out to sea from the town of Busselton, Western Australia. Because the shallow waters of Geographe Bay restricted ship movement, a long jetty was required so that the cut timber could be transported to the ships. In 1839 Governor Hutt appointed “the place in Geographe Bay opposite the Settlement at The Vasse to be the legal place for the loading and unloading of goods”. Construction of the jetty – originally known as the Vasse Jetty – commenced in 1853 after persistent pressure by settlers. In 1865 the first section, approximately 176 metres, of the jetty became available for ships to moor. In 1875 an additional 143 metres was added to the original structure, as over 10 years’ accumulation of drift sands had made the water too shallow for mooring. The jetty was continually extended until the 1960s when it reached its current length of 1841 metres. At the end of the Jetty is an underwater observatory where you can view the sea life through windows. Fascinating …. “The culmination of 10 years of planning and fundraising resulted in the opening of the Busselton Jetty Underwater Observatory on 13 December 2003. Located 1.7 kilometres from shore at the end of the Jetty, the Underwater Observatory has been designed to accommodate up to 40 people at one time. Descending 8 metres beneath the waters’ surface, visitors can view the amazing corals and fish life through eleven viewing windows, at various levels within a 9.5 metre diameter observation chamber. Described as Australia’s greatest artificial reef, the Busselton Jetty, with more than 300 individual marine species, is host to an awe inspiring “forest” of vividly-coloured tropical and sub-tropical corals, sponges, fish and invertebrates. Each year during autumn and winter, the Leeuwin Current brings a narrow band of warm water down the Western Australian coastline. Exercise but Don’t Sweat It! 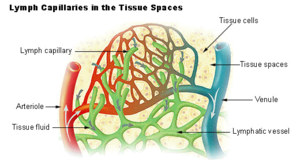 Lymph capillaries in the tissue spaces (Photo credit: Wikipedia) if the limb becomes to hot more lymph will gather in the tissue causing it to swell. This in turn puts pressure on the whole system. Exercise but don’t sweat it sounds a little crazy but when you have Lymphoedema this is the aim! Light exercise means light, not overdoing it but enough to move the lymph around the body but without creating more. Exercise is important in the treatment of lymphedema because the movement of the muscles stimulates the flow of the lymph into the capillaries, unlike the blood, which flows due to the pumping of the heart. Wearing a compression garment during exercise also provides resistance to further stimulate the flow. However if the body gets to hot this causes excess lymph to be produced and leak into the tissues, causing a negative reaction, the limb will become tight and uncomfortable. Exercise is part of the daily routine in some form, walking and swimming I find the best. My favourite is to find a pool I can walk up and down in, as the natural pressure of the water acts as a compression garment and the limb remains cool. In Australia we also have classes called Encore, for those who have had breast cancer, to do water aerobics to help with Lymphoedema, also to help avoid it. I wish there were classes for those with other forms of Lymphoedema, not just as a form of exercise but to meet others and learn from each other, maybe this could be the next project! Just the activities of daily life will help to move the Lymph, sitting and standing in one spot for any length of time is not helpful. When all the exercise is over and it is time to relax it is elevate, elevate, elevate!! Gravity will also help the lymph to travel away from swollen feet and ankles and encourage flow up the legs and into good lymph nodes. I also raise the end of the bed on a couple of paperback books to help lymph leave the legs during the night. Sometimes it is not possible to elevate the legs but I have a friend who has solved this by carrying a small folding stool with her everywhere, what a great idea! You know who you are!!! What helps your Lymphoedema? What do you miss being able to do?